We’d love your help. Let us know what’s wrong with this preview of Undaunted Valor by Donna Wichelman. But when Alessandro Mar For nature lovers, ski aficionados, travel enthusiasts and history scholars, the French Alps offer some of the most spectacular scenery and outdoor recreation in all Europe with its majestic mountain peaks, cascading waterfalls, unspoiled forests and quaint mountain villages. People come to get away from the daily grind and rejuvenate their spirits. To ask other readers questions about Undaunted Valor, please sign up. The Waldensian Series is unique and intriguing, immersing readers in the elite art world, the European mafia, and a brave group of people from history that I just discovered for the first time. Basically the Waldensians were a twelfth century pre-Reformation Protestant reformation movement (with roots in France and Italy), and these believers were intensely persecuted and nearly wiped out. This series from Donna Wichelman builds on that layered history by weaving in some fascinating art history The Waldensian Series is unique and intriguing, immersing readers in the elite art world, the European mafia, and a brave group of people from history that I just discovered for the first time. Basically the Waldensians were a twelfth century pre-Reformation Protestant reformation movement (with roots in France and Italy), and these believers were intensely persecuted and nearly wiped out. This series from Donna Wichelman builds on that layered history by weaving in some fascinating art history intrigue and a modern day mafia suspense story. We are introduced to the Waldensians as well as Jamie, Alessandro, and Nonni (Alessandro’s grandmother) in Light out of Darkness. While some of the dialogue lagged for me in places, bogged down a bit by narrative instead of conversation, overall this was a riveting read. Between the gorgeous Italian Alps setting (someplace I rarely get to visit in fiction – or otherwise lol) and the mysterious riddle, I was hooked from the beginning. Throw in the heart-in-your-throat suspense, Nonni’s delightful character, the chemistry between Alessandro and Jamie, and the history of a group of Christians that I previously knew nothing about, plus a tender message of trusting God, and I was able to power through the slower parts to enjoy the story. In Undaunted Valor, Nonni is in danger in the French Alps even as Jamie discovers some startling finds in her own family’s history. The action is even more harrowing and high-stakes in this sequel, with Nonni’s life on the line and dangerous terrain to keep the tensions high. She continues to be a light in the darkness, though, making for some unlikely allies along the way (possibly my favorite part of this novel!) and very tender faith moments. Again, the setting is one I don’t see much in novels, so it’s fun to visit it vicariously with the characters and learn more about the Waldensians in the process. Bottom Line: If you like different-than-the-norm settings, high-tension suspense, art and antiquities intrigue and sweet romantic chemistry, then you definitely need to check out The Waldensian Series by Donna Wichelman. Layered characters and fascinating history in a modern & picturesque locale draw you in and keep you engaged with the story and its outcome. Pop some popcorn and settle in for a riveting journey through Italy and France! 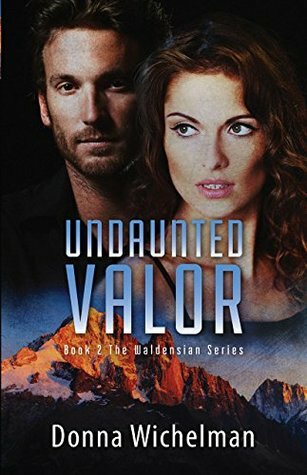 Undaunted Valor continues Jamie and Alessandro’s story in this second installment from Donna Wichelman’s The Waldesian Series. I enjoyed their story from the first book, Light Out of Darkness l, but enjoyed this one much more. I had a hard time putting it down and no problem turning the pages. I found their story to be fascinating, intriguing and exciting. I give Undaunted Valor 5 stars and I highly recommend it. It is so so good. I received this book from the publisher. This review is 100% my o Undaunted Valor continues Jamie and Alessandro’s story in this second installment from Donna Wichelman’s The Waldesian Series. I enjoyed their story from the first book, Light Out of Darkness l, but enjoyed this one much more. I had a hard time putting it down and no problem turning the pages. I found their story to be fascinating, intriguing and exciting. This story brings back one of my favorite characters from the first book. Luciana stole my heart in the first book, though she didn't feature so prominently in it. I admire her feisty spirit and love for life. I hate that she has been kidnapped, but I love being able to read through her thought processes. And again, the setting is a good one. I adore the area around the French Alps. It's just majestic and a place that everyone should aspire to visit at least once in their life. I like this book b This story brings back one of my favorite characters from the first book. Luciana stole my heart in the first book, though she didn't feature so prominently in it. I admire her feisty spirit and love for life. I hate that she has been kidnapped, but I love being able to read through her thought processes. I like this book better than the first one. It just seemed to flow better. I think it helped that there were fewer interruptions with characters speaking in their native languages. I understand the point of doing it, but it almost made the first book take longer. I also had fewer players to keep track of. And again, I adore Luciana. Plus my antique book geek side loved the secret Jamie finds in her grandmother's trunk. Donna discovered her true passion for writing at the United World College of the Atlantic in Wales, where she pursued the International Baccalaureate degree and focused on English Literature. At Atlantic College, Donna’s love of the classics awakened a desire to write books that touched the human spirit. While at AC, Donna wrote a thesis on Emily Brontë’s Wuthering Heights and visited the Brontë p Donna discovered her true passion for writing at the United World College of the Atlantic in Wales, where she pursued the International Baccalaureate degree and focused on English Literature. At Atlantic College, Donna’s love of the classics awakened a desire to write books that touched the human spirit. While at AC, Donna wrote a thesis on Emily Brontë’s Wuthering Heights and visited the Brontë parsonage in Haworth, England. Walking the heather-dressed moors on a drizzly day is forever etched in her mind as she happened upon an old man with a cap and a cane whose ancestors knew the Brontës. Emily’s poem No Coward Soul is Mine had an indelible effect on Donna’s faith. During her years at Case Western Reserve University in Cleveland, Donna took classes in English Literature as well as receiving her BA in Sociology and minors in political science and music. She went on to master in Mass Communications at San Jose State University. Donna worked as a communications professional before turning to free-lance writing. As a full-time writer, Donna pursued her dream, becoming certified in the Christian Writers Guild fiction writing curriculum and writing and directing dramas at her local church. She also authored personal essays, articles, and short stories for various inspirational publications, including Focus on the Family Magazine. During a city-wide campaign for Rick Warren’s 40 Days of Purpose, she wrote and directed a Video Skit for their Resource CD. Two of her devotionals appeared in A Cup of Comfort Devotional for Mothers and Daughters. In 2015 Donna self-published Light Out of Darkness. This contemporary suspense novel revolves around the unique story of faith and valor found in the pre-reformation Christians of the French and Italian Alps known as the Waldensians. Her sequel to the novel, Undaunted Valor, once again weaves Waldensian history around a contemporary story of intrigue and suspense. Donna and her husband Jim have been married for thirty-three years and live in Fort Collins, Colorado. She and her husband work in youth ministry at their local church. They also travel, hike and kayak as their schedules allow.